Having grown up in Colorado, the past spring and start to summer remind me of those in the 1980s and 1990s: daily storms, hail, and a few tornadoes. There are so many beautiful areas to the state after the rains, too. I've talked to other "natives" who feel the same as I do, and one mentioned the fire season always seemed to start around July 4th. I remember that also. In the 1980s and early 1990s we never really talked much about fires until nearly Independence Day. By the mid-1990s, I remember a lot of firework bans and professional displays being cancelled as fire conditions became worse with the changing weather pattern. 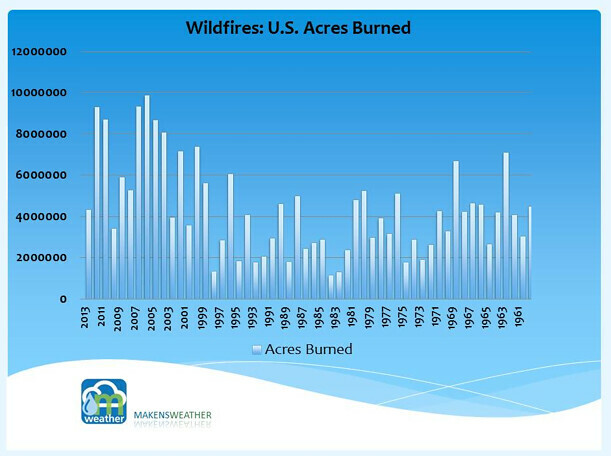 The United States has seen an increase in acres burned since the mid-to-late 1990s. This corresponds to the drought pattern shift that we've discussed previously on Weather5280.com. Despite the past few years of active wildfire activity, this fire season has started comparatively slowly. I see that changing a bit over the coming month, before the monsoon picks up in earnest. Just like a couple of decades ago, we'd shut the rain down a bit for a few weeks from late June through mid-July -- that's happening now. Colorado certainly isn't known for humidity, and as temperatures in the 90s become more frequent, we dry out incredibly fast. Recent days have proved this fact. Sunday we reached the mid to upper 90s across the Denver metro area, and most locations hit or exceeded 90 on Monday as well. We'll cool off Tuesday, but warm again by midweek with low storm chances will dry the state quickly. So far, we've only had a few small fires statewide. 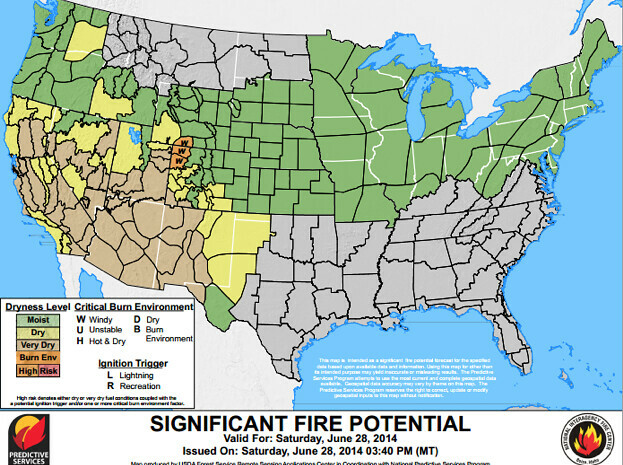 However, elevated fire conditions are returning and we can only hope against an active fire season. 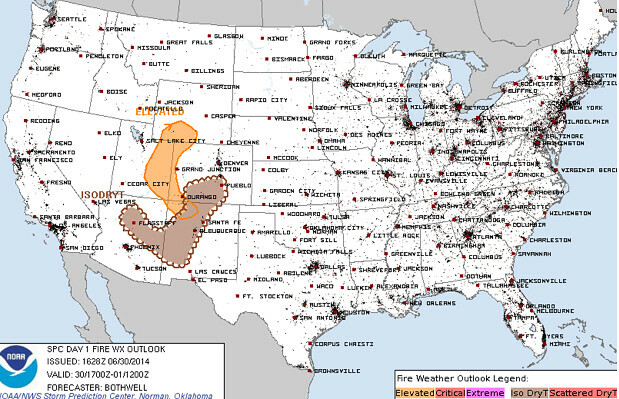 We'll likely see those elevated wildfire risk conditions in western and southern Colorado first. These conditions may grow across the rest of the region/state into mid-July. Those fire conditions will follow closely with the current drought areas. Yes, Colorado's drought has improved remarkably. It's a nice trend to see, but we still have a lot to overcome. The drought simply can't be beaten after a good season. 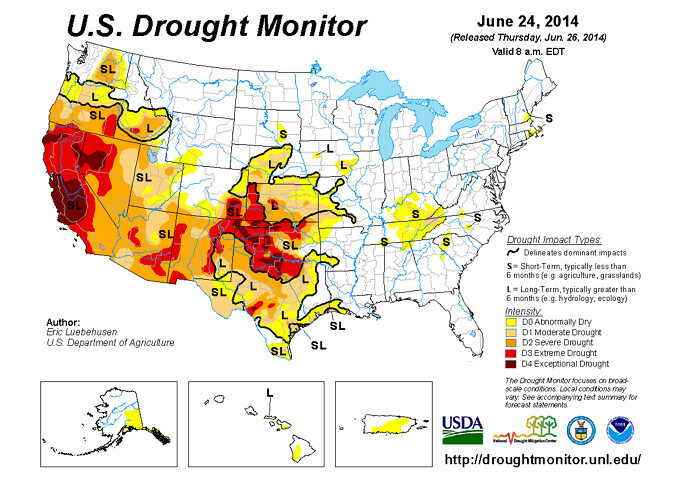 Drought conditions perpetuate over time, they aren't simply gone because we've had some rain. We are running on two back-to-back years of extreme drought in parts of the state. We will have to be vigilant as a community to be mindful of the fire conditions going through the next few months. We need to watch for areas of high heat and low humidity in the drought regions, and most especially a combination of those three things plus wind added to the equation. That's why the next week is very dangerous across western Colorado and western United States. The outlook has some hope for a lesser wildfire season, however. As Brian Bledsoe pointed out in his recent posting, the chances for a wetter than normal monsoon are there. I wish the chance were higher, but at least we aren't discussing a drier than normal pattern for this summer.